As I was driving to church early this morning, the sun was just coming up. I hadn’t actually seen it yet, but I saw beautiful hues of pink on some high clouds as I left my neighborhood. After traveling about fifteen minutes or so, I was on a road headed south. I wasn’t paying much attention to anything but what was in front of me. Suddenly, I looked to my left and saw a blazing sunrise in the east. Such dazzling, blazing light coming through the palm trees and past buildings….I had been driving along without even noticing it. The Bible tells us to acknowledge God in all our ways and He will make our paths straight. I think there are times when God is right there with us, wanting us to acknowledge Him, but we aren’t looking. If it looks good for you, then it surely IS good for you, right? Several weeks ago, I was walking along the beach and saw a beautiful sea creature on the sand. If something is beautiful, then it must be good, right? I recognized the creature for what it was, having witnessed its dangerous characteristics before. It was a dead Portuguese Man of War. A particularly poisonous jelly fish with venom-filled tendrils. Since it was dead, there was no problem, right? Years ago at the beach, one of our young sons, being curious and inquisitive, poked a dead Portuguese Man of War that was lying on the sand with his snorkel. A few moments later, he decided to go out into the water for a swim. Touching the part of his snorkel that had touched the jelly fish, he was suddenly in desperate pain. I will probably remember those moments the rest of my life as they taught us both a valuable lesson. The venom is still potent even AFTER the creature is dead. True wisdom is wisdom that comes from God. If we ask for His guidance in life, He will do just that—guide us. Things will look good, but He will say it’s not for us. Things will be beautiful, but He will tell us of the potential danger involved. While driving to the hospital to make a visit, I noticed the sunset was incredibly amazing. Not sure that I had ever seen anything quite like it before, I wanted to get some photographs of it. Shadows were reaching up from the horizon, crossing different layers of clouds, making finger-like projections. The entire collage of sun, shadow and clouds was inhabiting so much of the western sky, its vastness made the earth seem small in comparison. Many of my friends later communicated to me that they had seen this glorious sight, also. 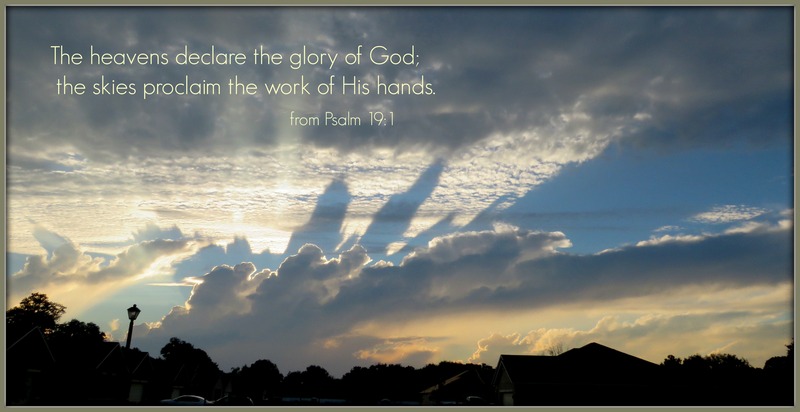 God was allowing us to see great beauty above as He pulled the blanket of sky and clouds away for the night, sending this half of the world to rest until dawn. Lately, when I am out walking for exercise, I have been listening to the same song on my phone over and over. I know that may seem a bit much, yet I think it is positive for me in a couple of ways. The song has a good tempo that keeps me walking at a brisk pace. Most importantly, the lyrics speak about how nothing is impossible with God. As I am trying to keep my heart and muscles physically fit, I am also renewing my mind by putting God’s truth into my hearing. 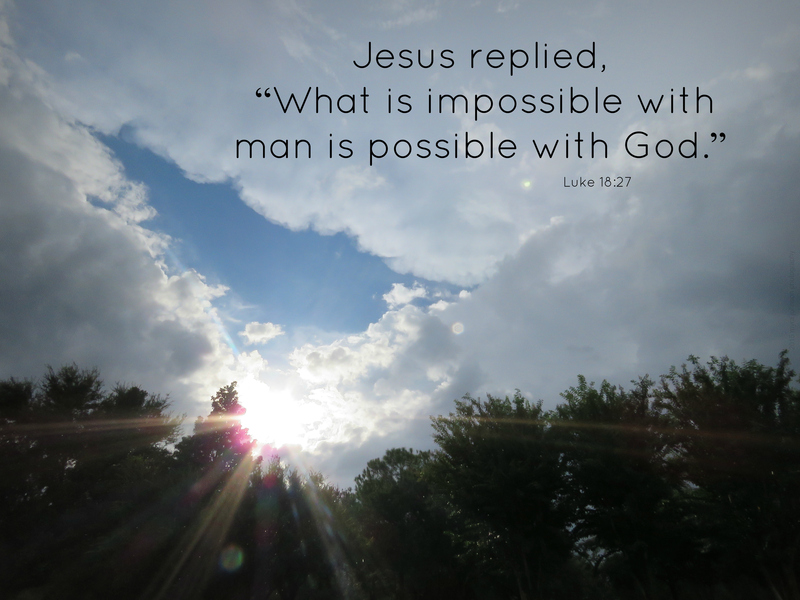 Even when I cannot see how a situation can be fixed, I must trust that what is impossible for me to understand, imagine or even carry out is not impossible for God.